PRIME Minister Narendra Modi on Saturday asserted that the NDA Government is committed to the Assam Accord and mulling granting Scheduled Tribe (ST) status to six communities in the State. The Centre is trying its best to implement the Assam Accord that was suspended by the Congress, Modi said. The Assam Accord provides for deportation of all illegal immigrants who entered Assam after March 1971, irrespective of their religion. “We have made efforts to protect the people of Assam, its culture and interests. The NDA is seriously considering granting ST status to six communities -- Tai Ahom, Muttock, Moran, Chutiya, Koch Rajbongshis and the tea tribes,” he said. Lashing out at Opposition Congress, he said that Assam, where only 40 per cent homes had power and gas connections till several decades after Independence, now has electricity and cooking fuel in almost every home. “The way you have supported me, blessed me, it has boosted my confidence to do better work for the underprivileged, poor and the tribal population. Barring the Congress and the terrorists, everybody is happy with the BJP Government,” Modi said. Listing his Government’s achievements, he said over five lakh people in Assam have been given homes by the NDA Government, 27 lakh families have received health insurance of Rs 5 lakh each and farmers have been given aid to take care of their regular expenses. Addressing the tea belt communities, Modi, who used to sell tea at a railway station in his early years, said “only a ‘chaiwala’ (tea seller) can understand the pain of fellow ‘chailwalas’”. “The NDA Government has taken initiatives to open bank accounts for tea garden workers. Lakhs of families in the tea belt have received Rs 5,000 as aid in two instalments, the Government has also decided to provide free rice and two kilograms of sugar to four lakh families in the tea belt,” he said. “This ‘chaiwala’ is committed to improve the condition of the tea gardens and its people in both Assam and West Bengal,” he added. Modi also asserted that the north-east has the power to become a new India’s energy hub and the Government is working hard to develop the region to realise this dream.The Prime Minister paid tribute to legendary musician Bhupen Hazarika prior to his speech. 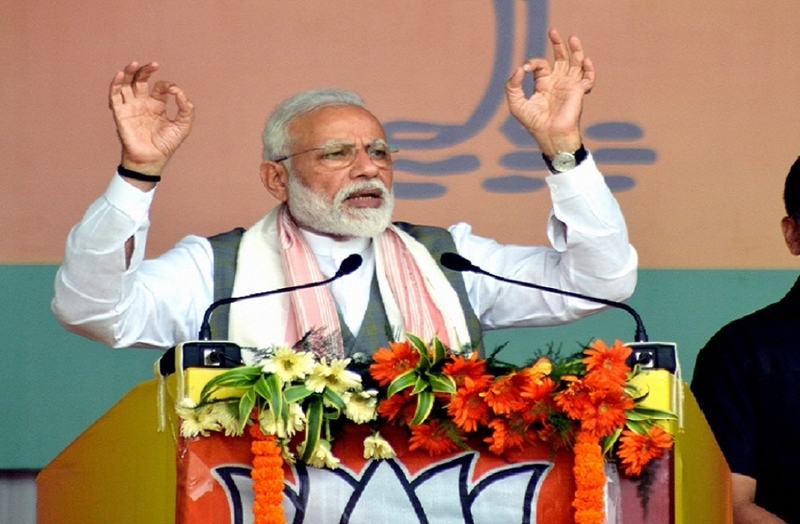 PRIME Minister Narendra Modi on Saturday asked the people of Arunachal Pradesh to vote for a ‘chowkidaar’ who would provide security to the country even as he attacked Opposition parties, saying that they were “disheartened” by India’s growth and success. Kicking off his campaign here for simultaneous Lok Sabha and Assembly polls in Arunachal, the Prime Minister said Arunachal is a “shield for the country with the people zealously guarding the border as sentinels”. “Whenever the country makes achievements, don’t you feel happy? Everyone, irrespective of their social and financial status, regales at India’s success stories. There are, however, some who feel disheartened by India’s growth and success,” the PM said. “When India hit terrorists in their houses, what was the stand of Opposition parties, you have all seen. Even when our scientists made achievements, they found excuses to belittle them,” the PM said.